How many of you actually love to pay tax & how many of you know that government ask us to pay tax via 25 different manners? 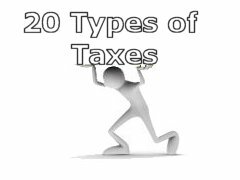 In this article I will provide you brief information about these 25 taxes in India. Tax is imposing financial charges on individual or company by central government or state government. Collected Tax amount is used for building nation (infrastructure & other development), to increase arms and ammunition for defense of country and for other welfare related work. That’s why it is said that “Taxes are paid nation are made”. If you purchase share at say 1000 Rs/- (per share) and after two months this price increased to 1200 Rs/-(per share) you decide to sale this stock and earn profit of 200 Rs/- per share. If you do so you have to pay Short term CGT (capital gain tax) @ 10% +Education cess on profit as it is short term capital gain. If you hold same share for 1 year or above it is considered as long term capital gain and you need not to pay capital gain tax.it is considered as tax free. Similarly if you purchase property after two year if you find that property price in which you invested has increased and you decide to sale it you need to pay short term capital gain tax. For property it is considered as long term capital gain if you hold property for 3 years or above. A lot of people do not declare their profit and avoid paying capital gain tax, as government can only tax those profits, which have been declared by people. To fight with this situation Government has introduced STT (Securities Transaction Tax ) which is applicable on every transaction done at stock exchange. That means if you buy or sell equity shares, derivative instruments, equity oriented Mutual Funds this tax is applicable. Current rate of interest on service tax is 14.5%. This tax is passed on to us by service provider. Tax imposed by Central government on sale of goods is called as Sales tax same is called as Value added tax by state government.VAT is additional to the price of goods and passed on to us as buyer (end user). Around 220+ Items are covered with VAT.VAT rates vary based on nature of item and state. 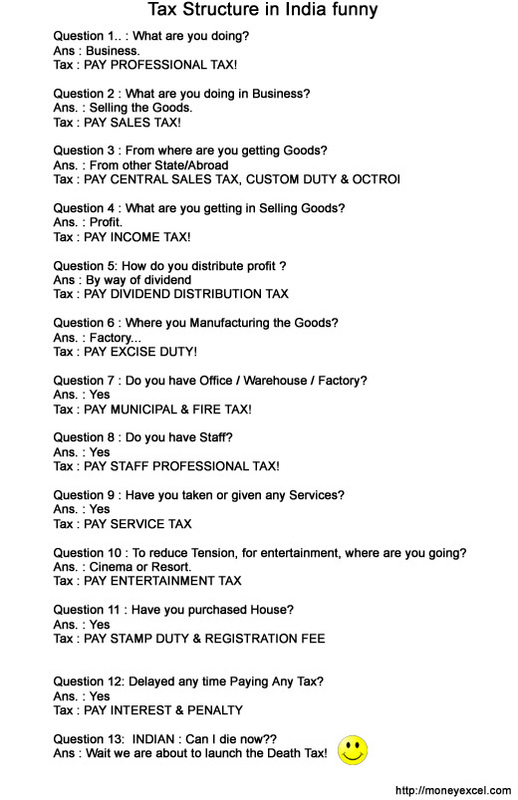 Custom Duty is a type of indirect tax charged on goods imported into India. One has to pay this duty , on goods that are imported from a foreign country into India. This duty is often payable at the port of entry (like the airport). This duty rate varies based on nature of items. If you are producer / manufacturer of goods or you hire labor to manufacture goods you are liable to pay excise duty. Dumping is said to occur when the goods are exported by a country to another country at a price lower than its normal value. This is an unfair trade practice which can have a distortive effect on international trade. In order to rectify this situation Central Govt. imposes an anti dumping duty not exceeding the margin of dumping in relation to such goods. If you receive gift from someone it is clubbed with your income and you need to pay tax on it. This tax is called as gift tax. Gift tax is not applicable if Gift is received from relatives. Wealth tax is a direct tax, which is charged on the net wealth of the assessee. Wealth tax is chargeable in respect of Net wealth corresponding to Valuation date.Net wealth means all assets less loans taken to acquire those assets. Wealth tax is 1% on net wealth exceeding 30 Lakhs (Rs 3,000,000). So if you have more money, assets you are liable to pay tax. Note:- Wealth tax is abolished by government in budget 2015.Now onwards surcharge of 12% is applicable on individual earning 1 crore and above. Swacch Bharat Cess is recently being imposed by the government of India. This tax is applicable on all taxable services from 15thNovemeber, 2015. The effective rate of Swachh Bharat Cess is 0.5%. After this tax we need to pay 14.5% service tax. In budget 2016 finance minister has introduced new tax namely Krishi Kalyan Cess. This cess is introduced in order to extend welfare to the farmers. The effective rate of Krishi Kalyan Cess is 0.5%. This tax will be imposed on all taxable services. Krishi Kalyan Cess would come in force with effect from June, 1, 2016. Once this cess is applied we need to pay service tax @ 15%. In budget 2016 finance minister has introduced a new tax on the dividend amount. It is proposed that 10% additional tax will be imposed on dividend income above 10 Lac from 1st April 2016 onwards. New Infrastructure cess on car and utility vehicle imposed recently in budget 2016. 1% infrastructure cess is applicable on petrol/LPG/CNG-driven motor vehicles of length not exceeding 4 meters and engine capacity not exceeding 1200cc. 2.5% cess on diesel motor vehicles of length not exceeding 4 meters and engine capacity not exceeding 1500cc and 4% cess is applicable on big sedans and SUVs. This entry tax is imposed by Gujarat, Madhya Pradesh, Assam, Delhi and Uttarakhand state government recently. The tax rate is variable 5.5-10% depending upon the state. All items entering in the state boundaries ordered via E-commerce are under this tax boundary. By Introduction of GST on 1st July,2017 all indirect taxes are subsumed in GST. Total 15 different taxes are abolished by introduction of single tax GST (Goods and Service Tax). Taxes removed by introduction of GST are Central Excise Duty, Service Tax, Value Added Tax,Countervailing duty,Custom Duty, Entertainment Tax,Luxury Tax,Lottery Tax,State Surcharge, Sales Tax, Antidumping duty, Swacch Bharat Cess, Krishi Kalyan Cess,Infrastrcutre Cess & Education Cess. LTCG tax on the stock market and mutual fund investment in reintroduced in budget 2018. As per new rule any person who sells shares after April 1, 2018, will pay a long-term capital gains tax at the rate of 10 percent on gains of more than Rs 1 lakh. For such shares, the cost of acquisition will be price as on Jan. 31, 2018. If a person who has held shares for more than one year sells them before March 31, 2018, there will be no long-term capital gains tax. So, total number of tax in India is reduced from 27 to 12. Note:- Please don’t forget to share this article & joke with your friends. « How to be a successful trader in stock market ? This is such informative article.Might be helpful for lot of people as you have explained it in much easier way than others and the joke is super awesome. What about WCT i.e Work Contract Tax…?? Contractor involves labour for work or service.Tax applicable on that is known as Work Contract Tax. Wao!!! That might be a good way to controll population. However, it may increase the rate of abortion (in case of “the unplanned ones”)and abandoning babies!!! Following Taxes will be charged on export of goods. (1) Customs Duty:- Customs Duty is a type of indirect tax levied on goods imported into India as well as on goods exported from India. (2) Export Duty:- Export Duty: Such duty is levied on export of goods. At present very few articles such as skins and leather are subject to export duty. The main purpose of this duty is to restrict exports of certain goods. We really Pay lot of tax in india what are your views ?